This is where you will find flyers and brochures on labor market information that show how to use our products, services and tools that are tailored for the employer, job seeker, student, youth, veteran, justice involved individual, researcher, educator, counselor, policy maker and many more. Here you will also find hot topics such as the "Urban versus Rural" brochure showing post recession labor market comparisons for Washington state. Also new to the site are 12 occupational outlooks for the workforce development areas (WDAs) and one for Washington statewide. These products provide links to resources and educate on what services are available. They can be viewed online or downloaded for events, such as workshops, with options for printing.  This page will grow as new products are added, so check back frequently to see what's new! This employer flyer provides labor market information such as monthly indicators, employment estimates, the learn about an occupation tool and the occupations in demand list. It includes information on services we provide such as wage and economic data, presentations, the YesVets program and more. This is a downloadable flyer for job seekers that provides labor market information and guidance on how to navigate our website. Check out our online tools to learn about occupations, current labor markets by county, employer demand for skills and research careers and training programs! 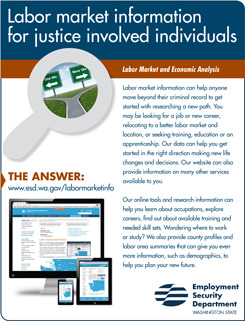 This flyer provides labor market information, such as the learn about an occupation tool and employer supply/demand reports. Check out our labor area summaries and county profiles. We also have 13 occupational outlooks. Try out our tableau visualizations and customize your research! This flyer provides labor market information such as the Learn about an occupation tool, employer demand reports, military crosswalk tool for translating skills to job openings, labor area summaries and county profiles. Check out the employer supply/demand reports and much more! Labor market information can help anyone move beyond their criminal record to get started with researching a new path. This flyer has links and resources, such as the "Get Started Guide" through CareerOneStop. 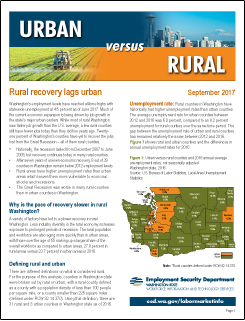 A flyer for Washington agriculture including a dashboard with statistics on covered employment and wages, H-2A applications, requested workers, wage rates and more. This brochure covers the labor market comparing urban areas with rural areas including population, the labor force, employment and unemployment, median hourly wages, supply/demand and median home prices. This brochure covers the exact same topics as the short version, but it also includes a 5-year breakout by county from 2012 to 2016. It also compares urban versus rural annual average employment change by industry sector from 2012 to 2016. 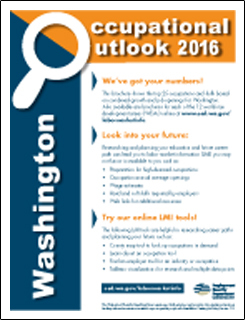 Below are 13 occupational outlook brochures - one for each workforce development area (WDA) and one for Washington statewide. The brochures cover the top 25 occupations between 2015 and 2025. They also include the top 25 hard and soft skills required by employers. These brochures can be downloaded in an 8 1/2 x 11 (4 pages 2-sheet brochure) or 11 x 17 (4 pages 1-sheet folded brochure) format. Make your selection by clicking on the format link below the WDA name.